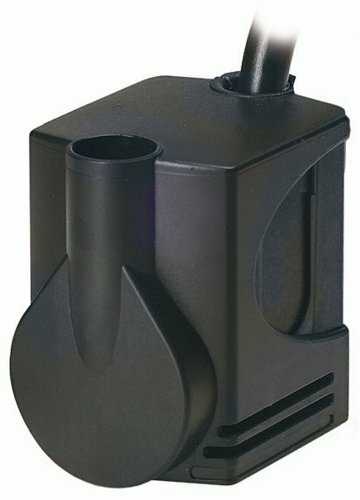 Little Giant PES-120 Statuary Fountain Pump, Wet Rotor Pump, 120 GPH | Fountain City Art Ctr. This wet-rotor pump, often referred to as a magnetic-drive pump by other manufacturers, utilizes an epoxy encapsulated motor and plastic housing. A permanent magnet is attached to the impeller. The magnet acts as the rotor would in a conventional motor. The water being pumped surrounds the rotor, thus the term "wet-rotor". It is seal-less and oil-less. This pump works well in water garden, statuary and some industrial applications. It is compact in design and is the most energy efficient type of pump Little Giant manufactures. The other side of this efficiency is very little starting torque. Therefore, the pump does not produce as much pressure and will not pump water as high as its' epoxy-encapsulated counterpart. WET ROTOR PUMP: This wet-rotor pump, often referred to as a magnetic-drive pump by other manufacturers, utilizes an epoxy encapsulated motor and plastic housing. This pump works well in water garden, statuary and some industrial applications. FOUNDATION PUMP: It is energy efficient and UL listed. It has corrosion resistant body. MAGNETIC DRIVE PUMP: A permanent magnet is attached to the impeller. The magnet acts as the rotor would in a conventional motor. The water being pumped surrounds the rotor, thus the term "wet-rotor". LITTLE GIANT PUMP: It is compact in design and is the most energy efficient type of pump Little Giant manufactures. The other side of this efficiency is very little starting torque. It has seal-less and oil-less design. STATUARY PUMP: It has built-in flow control, 4-foot maximum lift, Discharge adapters for 1/2" or 3/8" I.D. tubing, 6' power cord.